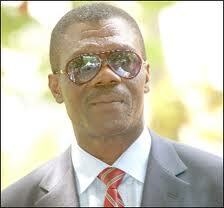 The Human Rights Court in Accra has thrown out a legal objection raised by Lt. Col. Gbevlo Lartey (Rtd. ), National Security Coordinator in the case in which Shirley Ayorkor Botchway, Member of Parliament (MP) for Weija is seeking to enforce her fundamental human rights under the 1992 Republican Constitution. Shirley Ayorkor, a former Deputy Minister under the previous administration, is currently battling the ruling National Democratic Congress (NDC) government in the law courts in relation to a piece of land (Plot No. 12A) that she acquired at Ridge, Accra in 2007. She has jointly sued Brig. Gen. Joseph Nunoo Mensah Rtd, National Security Advisor, Lt. Col. (Rtd) Larry Gbevlo Lartey, and the Attorney-General, claiming that the first and second defendants are using security operatives to take the land which she has started developing on the basis that the land belongs to the state. The plaintiff’s affidavit in support of her application said she leased a plot of land from the President of the Republic of Ghana in 2007 but on April 15, 2010 while her workers were busily at work, some group of men who said they were coming from the National Security and had been sent by the first and second defendants ordered the workers to stop work immediately. The security operatives, the plaintiff averred, then erected a signboard with the inscription ‘Government Property. Stop Work. Keep Off, By Order’ and left telephone numbers for her to call and find out. She said she reported the matter to the Director-General of the Criminal Investigations Department on April 16, 2010. She also wants damages for wrongful and unlawful interference and violation of the applicant’s human rights and an order for perpetual injunction to prevent her from developing the land. As a result both the first and second defendants were served on April 28, 2010 and the third defendant was served on April 21, 2010. However, on May 11, 2010, Lt. Col. Gbevlo Lartey, through his solicitors, filed a notice to raise legal objection to the Weija MP’s motion. The security capo contended that the applicant’s lease upon which she relies to enforce her alleged rights is ineffective as an instrument affecting the land. The defendant contended that if the MP’s lease were effective, the applicant would have been in breach of covenant in failing to show that within three years of execution she has built a house to the value of the amount specified in the lease or has built a surrounding wall around the area to which the site plan attached to the lease relates. The court said there are no competing interests and the fact that the applicant has not yet registered her land does not bar her from taking steps to enforce under Article 18 (1) 0f the Constitution.